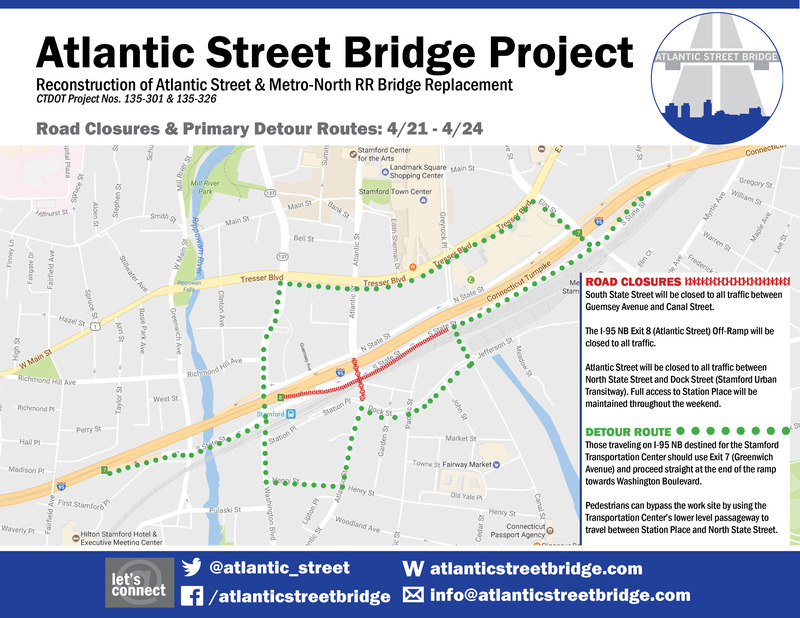 To accommodate construction of the new I-95 Exit 8 off ramp bridge over Atlantic Street; South State Street, Atlantic Street and the I-95 Northbound Exit 8 Off Ramp in Stamford will be closed beginning at 9pm on Friday, April 21, 2017 through 6am on Monday April 24, 2017. Traffic will be detoured around the construction area. South State Street will be closed to all traffic between Guernsey Avenue and Canal Street. 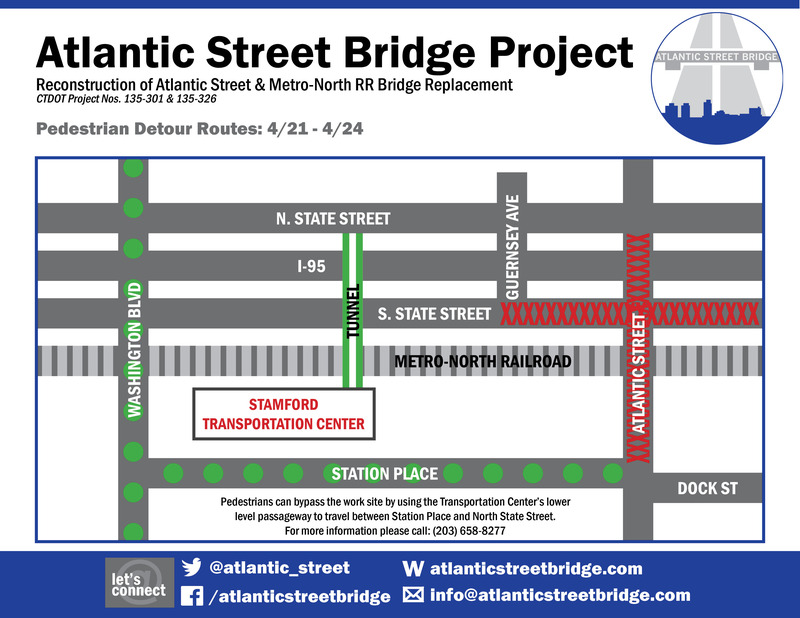 Atlantic Street will be closed to all traffic between North State Street and Dock Street (Stamford Urban Transitway). Full access to Station Place will be maintained throughout the weekend. 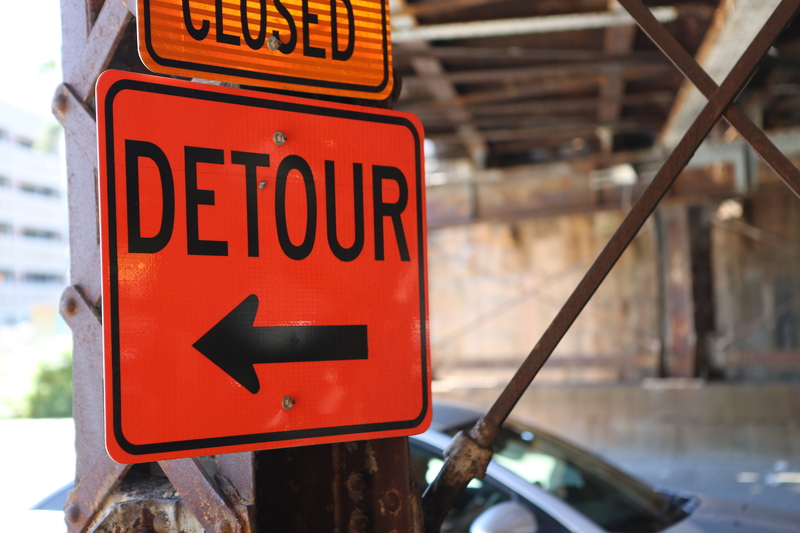 The I-95 NB Exit 8 (Atlantic Street) Off-Ramp will be closed to all traffic. Those traveling on I-95 NB destined for the Stamford Transportation Center should use Exit 7 (Greenwich Avenue) and proceed straight at the end of the ramp towards Washington Boulevard. Variable message signs on Interstate 95 and local roadways will be utilized to advise motorists of traffic conditions in the area. Pedestrians can bypass the work site by using the Transportation Center’s lower level passageway to travel between Station Place and North State Street. The route will be signed. Motorists and pedestrians should be aware that modifications to the proposed schedule, including postponements and/or extensions may be necessary due to weather delays or other unforeseen conditions. The closures will be used to minimize the duration of traffic impacts and to expedite the associated work involved in lowering the intersection of Atlantic street at South State Street in anticipation of steel erection for the new off ramp bridge. This “intermediate roadway lowering” is required to allow for the legal 13’-6” vertical clearance required for truck traffic. DOT Project No. 0135-0326 was awarded to Yonkers Contracting Co., Inc. on January 15, 2016 for $33,881,217.09 and is anticipated to be complete in June 2018. Work consists of improvements to the Interstate 95, Exit 8 off ramp and to the adjacent areas along Atlantic Street and South State Street in Stamford. This project will improve the lane configuration along South State Street and provide a more efficient traffic flow exiting I-95 as well as improve the drainage in the area. This work is being performed as a precursor to upcoming DOT Project No. 0135-0301, under which the existing railroad bridge over Atlantic Street will be replaced with a new structure that will provide for improved traffic flow between Downtown and South Stamford while also accommodating future enhancements to rail operations. Construction on 0135-0301 is expected to begin in Fall 2017. Both projects are administered by the DOT’s Office of Construction – District 3, New Haven.